"Songs are like tattoos, you know I've been to sea before. Crown and anchor me, or let me sail away. An empty space to fill in." My Canon lens is broke-ded, so, alas, the pictures are not as lush as I would like, but here is the main dish, a cool and subtle soup comprised of soft shades of blue, aqua, lavender and some unexpected pops of sweet pink. Fits in perfectly in my dusty periwinkle studio. Yes, that's the color of my studio, not hot pink or bright orange or neon green or any of the colors one might expect. I don't like to be predictable. 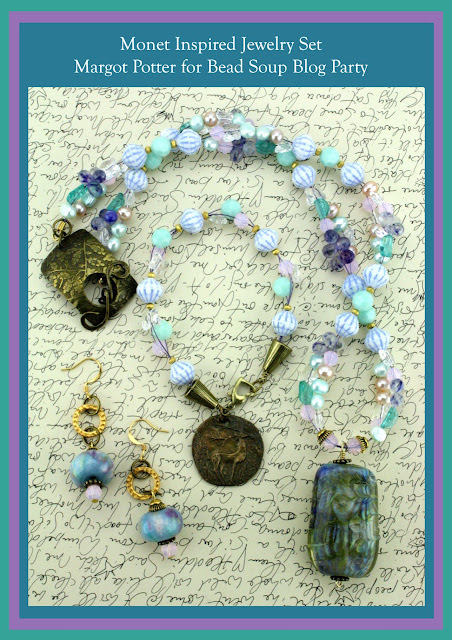 My partner Liz of Elizabeth Beads made some of these luscious art glass beads and also sent pretty Czech glass and freshwater pearls along with a stunning clasp. I added some metal accents from TierraCast, exposed purple beading wire, kyanite, SWAROVSKI ELEMENTS and the King Stag pendant from Green Girl Studios. It all felt so lush and springlike, seemed apropos. He's been waiting quite some time to find a home! 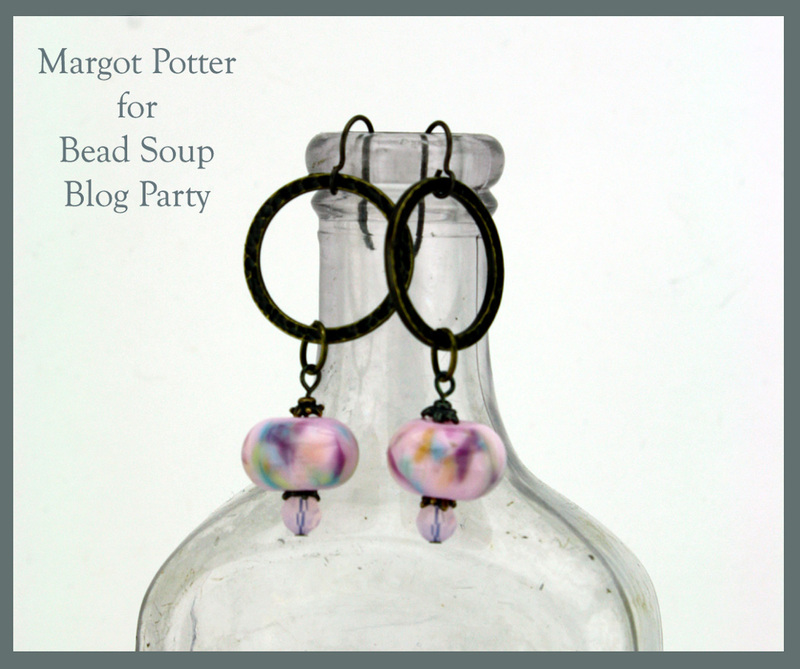 I had extra beads, so I used some Tim Holtz and TierraCast findings to make alternate earrings, pulling out different colors from the main pieces, depending on your mood or the outfit you wear that day. I like options, how about you? These are simple techniques, my signature exposed woven wire techniques I've been creating for many years, all designed to showcase the materials without detracting from them or competing with them or the wearer. Some beads need little more than a pretty frame and hopefully I have provided one. 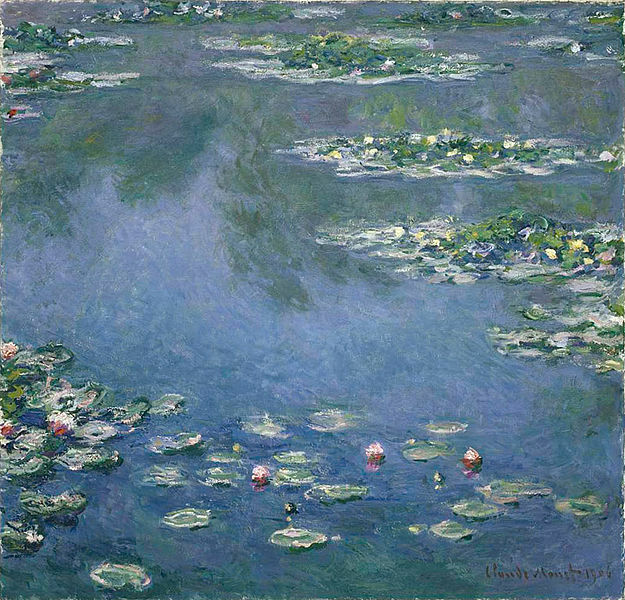 When I finished, it occurred to me that this combination of colors and elements was quite reminiscent of Monet's Water Lilies. There is your song from me." An homage to Liz's lovely use of lyrics from many of her favorite musicians, I return with a favorite of my own from one of my favorite muses, Joni Mitchell. Come now, let's see what the other talented people have brewed! Follow the links below to the participants and hostess Lori Anderson! Lovely pieces. They definitely look Monet inspired! Such a lovely set of soup. The contrast of color pops the focal bead perfectly! 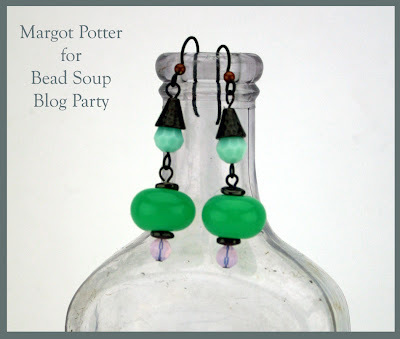 Margot -- I love love love what you made with my beads! 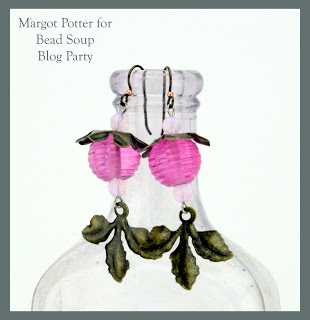 Did you notice we each made 3 pieces, necklace bracelet, earrings?! It was a privilege to have you as my BSBP partner, to discover your blog and to watch you on Craft Wars. Thanks for the inspiration, my fellow Joni Mitchell aficionado. "Lots of laughs, lots of laughs." Thank you all for your kind compliments. Yes, lovely soup indeed! Elizabeth, yes! I did notice! 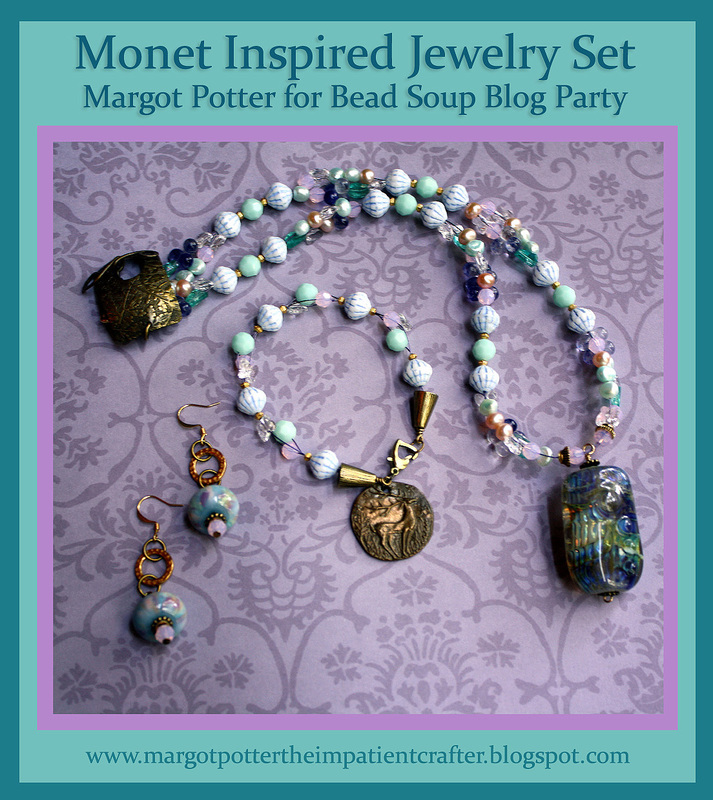 Love what you did with my soup, it was an honor to work with your beautiful beads. So glad we met! Love what you made from your soup. Gorgeous earrings! LOVE the colors! You really made some awesome things here and the inspiration is apt. Thanks so much for participating and I hope you come again in Jan/Feb! 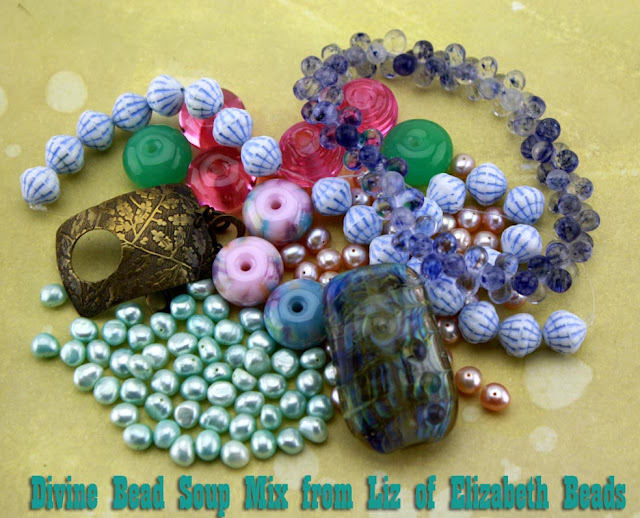 Wow, what a gorgeous bead soup! You did an awesome job...your creations are beautiful...definitely Monet inspired, love those blues! 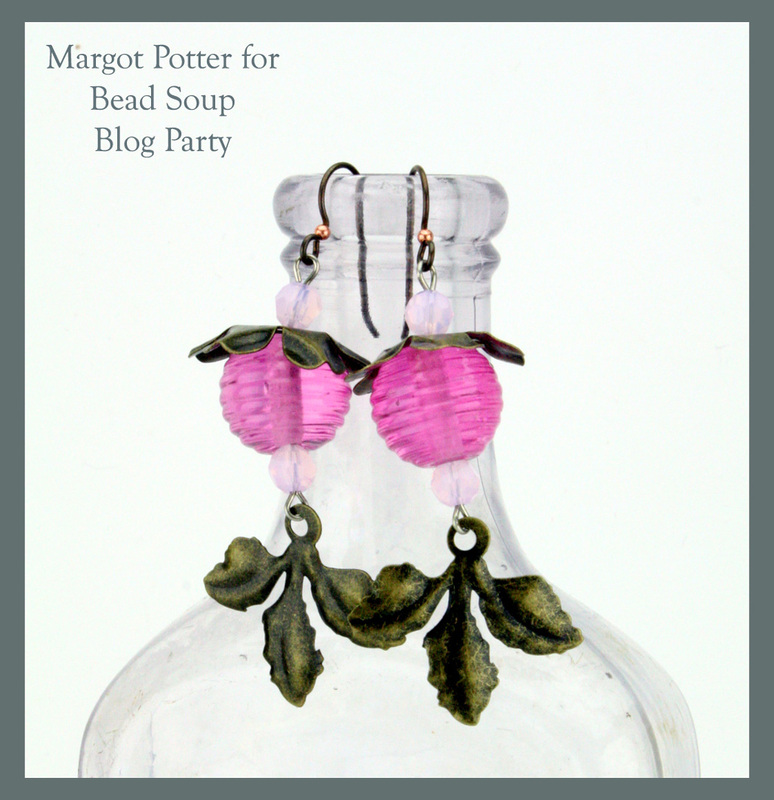 I especially like your photographs of your earrings - beautifully done and beautifully photographed! Oh my. This set is much softer than your other pieces I have seen. I just love it! You've created some beautiful pieces with your soup! So sweet, very good design! I love all your pieces, those colors are beautiful! Love, love, love!!! such a delicate touch and still so popping out!! I love the way you mixed up your beads in colours in your designs!! great necklace, stunning colours! congratulations! Mesmerizing!! I could look at your lovely creations for a very long time. The colors are so soft & gentle. 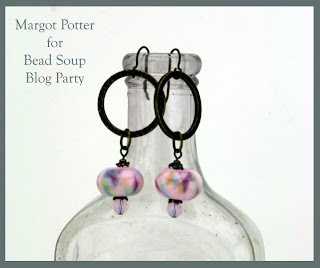 I also make more than one pair of earrings for a necklace sometimes. It's good to know that I am not the only one. Margot...dare I say that you have made Monet proud..beautiful pieces!!! You did a really soup-r job! What a beautiful set. Love it. It is quite obvious what your inspiration was. Great job! What a wonderful piece. I love the softness of it. Very feminine. great job you did with your soup! i love the colors and the name you gave is just perfect! Love your designs, very beautiful! 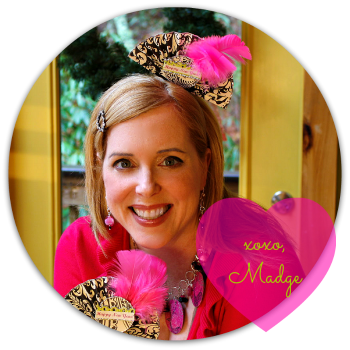 You have a lovely blog and your pieces are beautiful! love the colors! and love your creations! I love your inspiration!! You complete set is lovely and very cohesive. Love the earrings too. Really really pretty set, very Monet! Love the necklace, especially love those pretty lampwork earrings! Lovely pieces! I love your Monet-inspired set! !